I’ve been playing around with this apple bundt cake recipe for the last few weeks – just little tweaks here and there – and yesterday, I finally baked the perfect one. 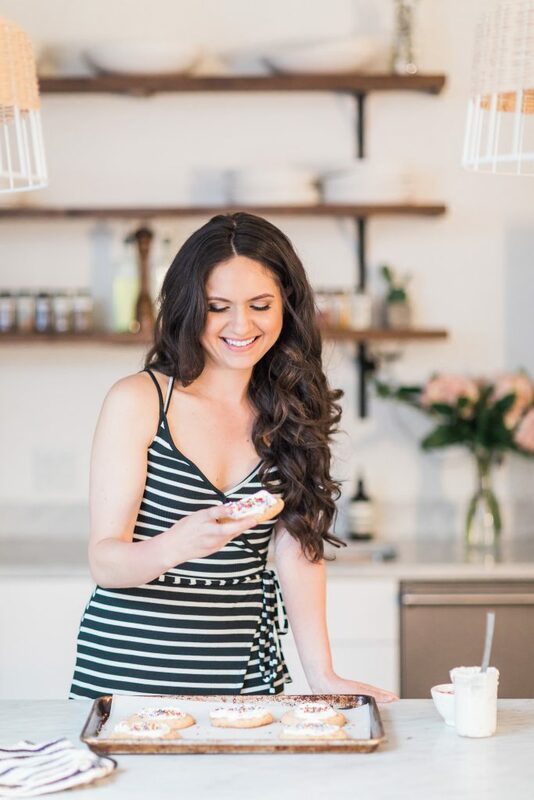 Oh success… you’re sweet! It was quite a delicious journey and all, but I’m mucho happy I’ve found my “the one”. A girl can only eat so many slices of cake (this was cake #4! )… before she needs a cookie 😉 Or a cocktail! Since it’s Friday, I think maybe both? Anyway, lets talk cake! And more specifically, why this one is so dang amazing. First, and most importantly I think, it’s 100% applelicious! Not only is it PACKED with fresh apple chunks – lots and lots of them! – it has a big splash of apple cider in the batter which adds a whole other element of apple awesomeness. WIN! This hunk of a bundt is also moist, rich in brown butter flavor (which totally jives with the apples! ), and slathered in a robe of bourbon butterscotch sauce… which is EPIC! It’s one of my new favorite toppings not only for cake, but also for ICE CREAM! I say double it up and make two batches. Happy Friday! I hope you guys have a fun/safe/gnarly weekend planned? We’ll be running tons of errands Saturday, with hopefully a little shopping somewhere in the mix! I really want a cute sweater dress, but so far they’ve all been BULK city. If you guys have any suggestions, toss em this way, please. 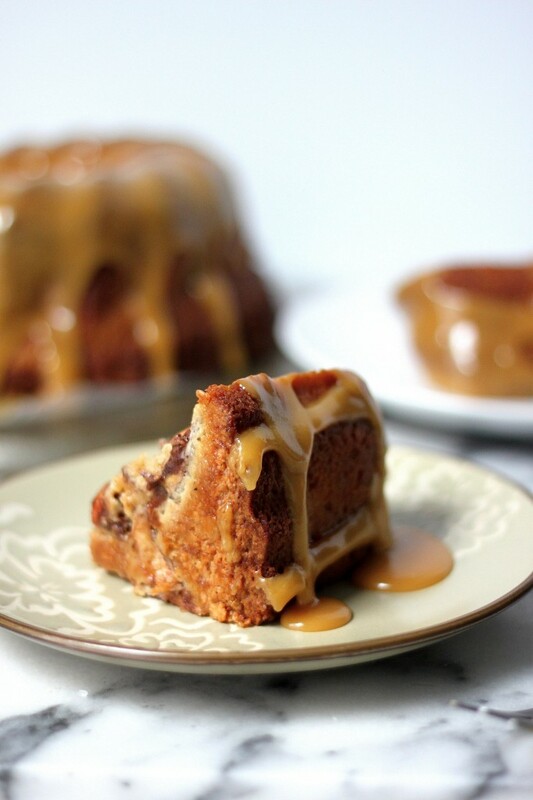 Moist and incredibly flavor brown butter bundt cake topped with a bourbon butterscotch sauce. Place the apple cider in a small saucepan and simmer over medium-low heat, stirring occasionally, for 20 to 25 minutes, or until the cider has reduced to a 1/2 cup. Reducing the cider allows you to get a more intense apple flavor. Transfer the reduction to a heatproof measuring cup and place it in the fridge to cool while you prepare the other ingredients. It should be room temperature when added to the batter. Preheat oven to 350 degrees (F). Generously grease a large bundt pan; set aside. Peel, core, and roughly chop the apples. Place them in a medium-sized bowl; add 2 tablespoons of flour and toss well to coat; set aside. In a medium-sized saucepan melt the butter over medium-heat, stirring almost constantly, until it's light amber brown in color and smells slightly nutty - careful not to burn the butter! Remove pan from heat and stir in the vanilla. Set aside. In a medium-sized bowl whisk together the eggs, cooled apple cider reduction, remaining granulated sugar, and brown sugar; mix well to combine. Set aside. In a large mixing bowl whisk together the remaining flour, baking powder, baking soda, remaining cinnamon, ground ginger, and salt. Whisk in the egg mixture, then the butter and oil, then gently fold in the milk; do not over mix! Add half of the batter to the prepared bundt pan, then sprinkle 1/2 of the apples on top before adding the remaining batter. Add the remaining apples to the top of the batter, then place the pan in the oven. Bake for 65-75 minutes, or until a cake tester comes out clean. Allow the cake to cool in the pan for 20 minutes before removing it from the pan and transferring it to a cooling rack to cool completely. Melt butter in a medium heavy-bottomed saucepan over medium heat. Add the sugar and cream and whisk until well combined. Bring to a light boil and cook for about five minutes, whisking occasionally. Remove from heat and whisk in bourbon. Cool slightly before drizzling over cake. To save time, the butter may be browned ahead of time and stored in the fridge for up to two days. The butterscotch sauce may be may ahead of time and stored in the fridge for up to one day. 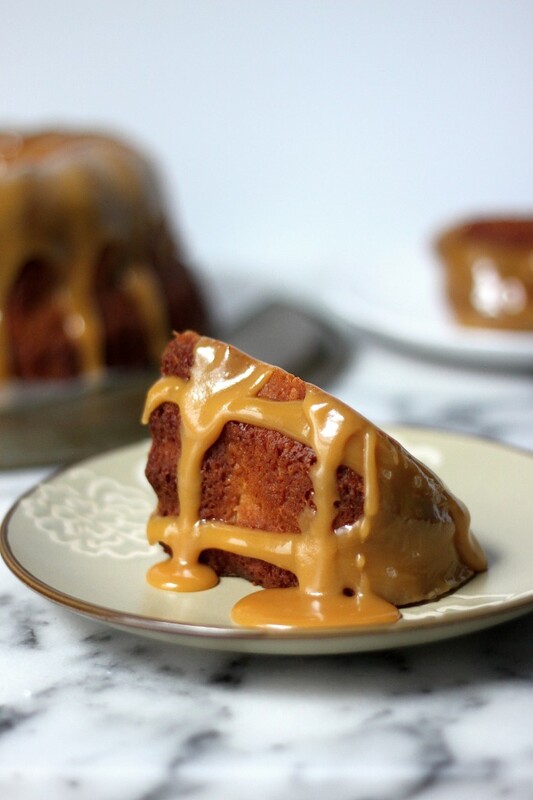 Warm the butterscotch sauce in the microwave for 10 seconds before pouring it over the cake. OMG. While this cake looks wonderful, is it socially acceptable to leave it for another time and just eat the sauce with a spoon? 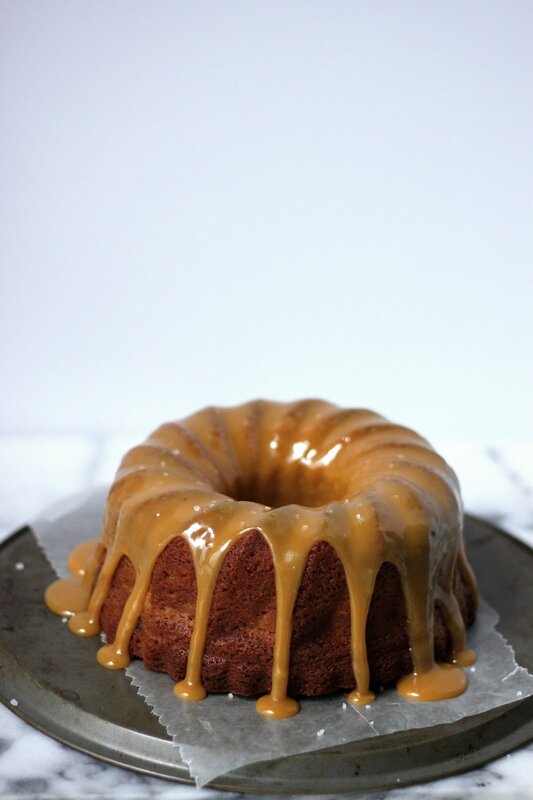 I could easily see this bundt cake being my “the one!” It looks amazing with that drippy butterscotch sauce! Could you please save me a slice? I can’t get over how perfect and incredibly delicious this cake looks. Brown butter AND bourbon….this is a big fat heck yes! That Butterscotch Sauce looks pretty magical! Wow! I am so happy you are over that nasty old cold. This post is exactly why I love Baker By Nature!! Have an awesome weekend! OMG! That bourbon, butterscotch sauce looks amazing! I think I would want to more myself a glass and drink it! I am glad you tweaked this recipe to perfection because I need three or four slices ASAP. 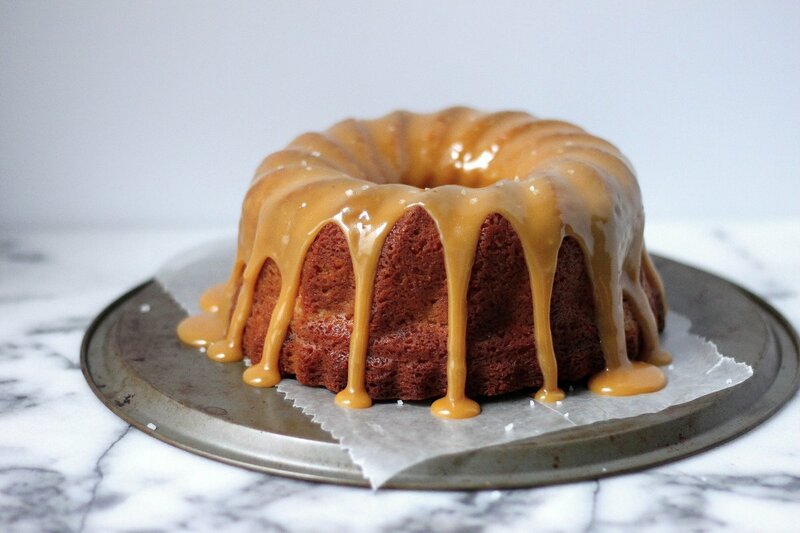 The cake looks amazing and the butterscotch sauce, oh yum. I love how it looks and sounds. This looks ooey gooey and absolutely delicious! I love apple cakes, and then you added brown butter and that mouthwatering sauce. Perfection! Apple cake is one of my all time faves! It’s delicious! And your’s is so dang pretty too! I am all over this!! Especially that bourbon butterscotch! i just found your blog – and boy am i glad that i did! BOURBON BUTTERSCOTCH? yes please!! I am ALL ABOUT that bourbon butterscotch sauce! I mean, the cake looks amazing too, but I just cannot get over that sauce! Looks so great – that glaze especially! Oh wow — this is one beautiful looking cake. The bourbon butterscotch glaze is just dripping with deliciousness. And you added apple cider to the cake, too?! Yum! Note to self – GET A ROBE OF BOURBON BUTTERSCOTCH SAUCE. ASAP. This is definitely a perfect fall cake! A few days late but WOW!! Bourbon butterscotch sauce?? I am in love!! That sauce!! Oh my goodness I want to eat it with a spoon. These are the cutest little bundt cakes ever! 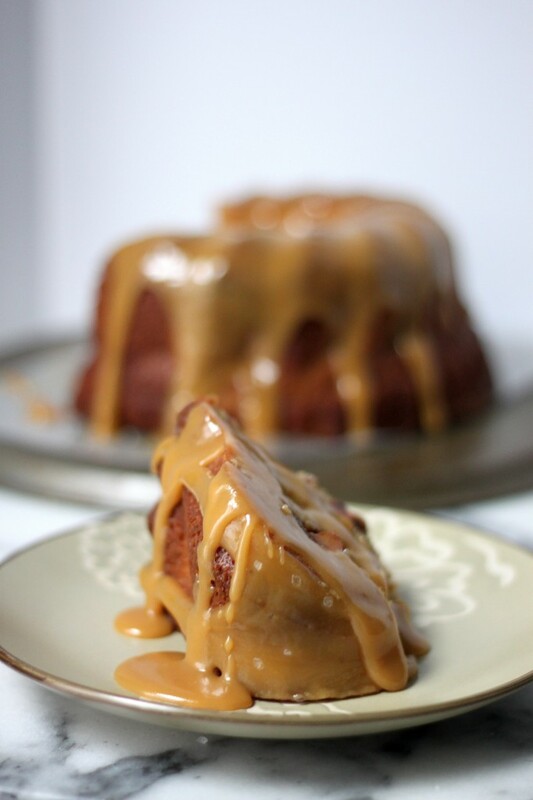 This cake looks incredible Ashley and that bourbon butterscotch sauce is just magnificent! This cake! This sauce! I want a giant slice right this very minute. What a gorgeous cake for fall! I would love this for Thanksgiving. Love this idea! Planning on baking it for thanksgiving this year! What size pan did you use? Do you have an updates recipe for a bigger pan… Maybe 9″? Thanks in advance! I have been drooling over this recipe for weeks and am so excited to make it for Thanksgiving this year. What kind of Apple Cider do you prefer? I haven’t found one that reduces down well. I just made this and didn’t realize until after the cake was baked that the directions don’t tell you where to add the ginger and I completely (accidentally) left it out. Does the ginger go in the apple mixture or the batter mixture? 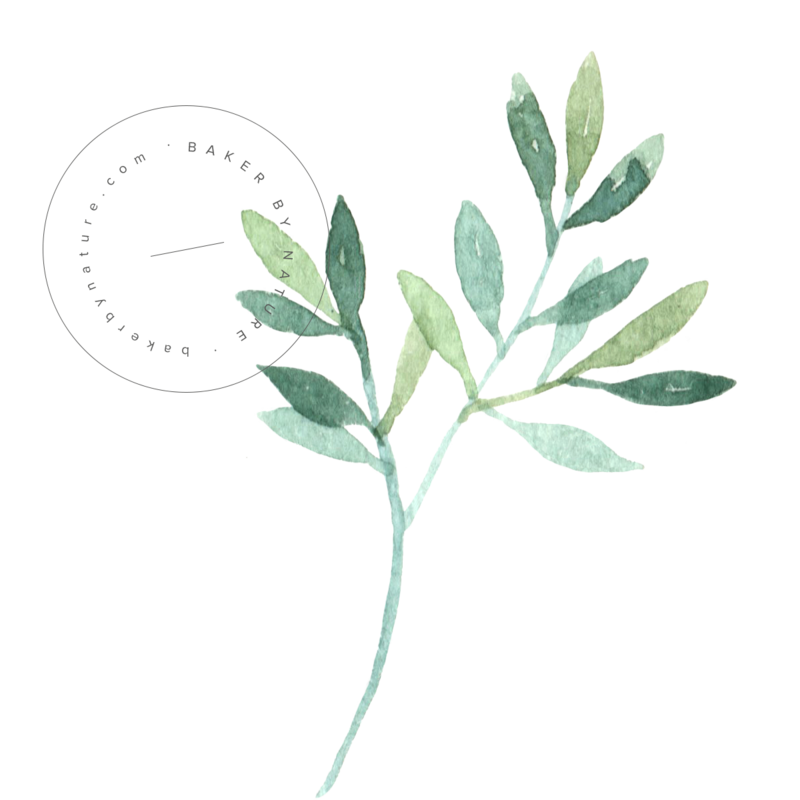 Hi Berri. The ginger gets whisked in with the dry ingredients (flour, baking powder, baking soda, and salt). You inspired me to rewrite the recipe this morning in a (hopefully) easier to follow form. I wrote this recipe many years ago, so it was in need of a makeover, so to speak. How did your cake turn out? I just made this recipe and wish I would have read the whole thing before tackling this beast! There are so many steps, bowls and special handling of the ingredients that I found myself getting very frustrated! I have been baking for years and I use it to de-stress. This certainly did not do that! I followed the butterscotch recipe to a T and it was very gritty so perhaps I had the heat too high? I had to make another batch and used Pioneer Woman’s recipe. The cake is baking now. I’m so worried it won’t turn out. I hope it is as tasty as it looks in your pictures! Ashley, this recipe needs to be rewritten. You cay to divide the sugar but you don’t spell pout how much when. You say to add brown sugar to the sauce and to the batter but you don’t spell out how much in each measurement. Just the one listed under ingredients. It did turn out! My oven cooks a bit cool so it took about 85 minutes. Everyone loved it! The cake was very moist and flavorful. I’m almost positive my butterscotch on the first try was cooked too hot as the second I cooked on medium low and it was smooth. The recipe was a success overall even with my nervous breakdown. I will start reading recipes all the way through first! Hi! Wanting to make this but a few things in the recipe are stumping me. 1st in the ingredients it calls for sour cream then in the instructions it talks about greek yogurt, i know you can sub in yogurt for sour cream just checking the discrepancy before i start. Also the Bourbon sauce does it actually have Bourbon? I can’t see that it does unless you sub Bourbon for the vanilla? This looks so yummy can’t wait to try it! Did you change this recipe? The instructions leave out a number of ingredients and I don’t recall having this problem before when I made it. This cake recipe looks fantastic! Question: would it be possible to make a lyer cake version of this bundt cake? I was thinking of doing this for a birthday party. If so – what do you think the bake time and temperature would be? Thanks for your superb ideas. I’m sitting here trying to figure out how to make this cake. It says to divide the sugar, but doesn’t say how much and where the sugar goes. It says to use brown sugar, but the only place it calls for brown sugar is in the bourbon sauce. It later says to divide the cinnamon, but no where is it mentioned earlier. I assume the sugars and cinnamon are supposed to go in the apples, but it doesn’t say how much. HELP!